It takes some serious guts to go out and claim to be developing the first truly next-generation RPG. Just saying you’re making a fantastic game is one thing, but when you’re carrying the weight of both new technology and an entire genre on your back, life probably gets a bit stressful. However, CD Projekt RED, the Polish team behind The Witcher 3: Wild Hunt, seems to be confident in its conclusion to one of gaming’s most interesting trilogies. The debut trailer that was featured during Microsoft’s press conference was stunning, but all the claims that have been made about Wild Hunt really started to seem feasible when I got a good look at a build of the game a few days later. On paper, The Witcher 3 sounds massive to the point of intimidation. The traversable world is said to be 35 times larger than the one found in The Witcher 2, which supposedly makes it “20 percent bigger than Skyrim.” But it’s not just big for the sake of bragging rights. The environments are said to be brimming with interesting characters, wondrous architecture and more quests than you’ll probably have time to complete. This means there are at least 100 hours of solid gameplay waiting for anyone willing to embark on Geralt’s final expedition, and that number will likely increase for those interested at picking each new location clean of content. But facts and figures like these are designed for fancy press releases. I saw the game running on a PC at E3, and what really matters is the fact that this game looks as gorgeous and expansive as you’d hope. The 30-minute chunk of content we saw had Geralt exploring dilapidated villages, traversing wide-open stretches of land (both on foot and through a fast-travel system) and digging his sword into the gullet of whatever creature crossed his path. One encounter that stood out involved a massive, horned beast that was simply stumbling across the plains. His blood seemed to boil over as our favorite Witcher came into sight, and from there, an extended battle sequence ensued. The action looked similar to what we’ve seen in the past, as Geralt blended both quick swipes of his steel with a stream of crackling fire to down the beast. Since this was the pre-alpha version of the game, some of the hit detection and damage balancing wasn’t as polished as you’d expect in a retail release. It took the developer close to 10 minutes to bring the ugly thing down, which drew a few chuckles from those in attendance. However, the fact that such unique, multi-skilled enemies will be wondering the world is exciting. 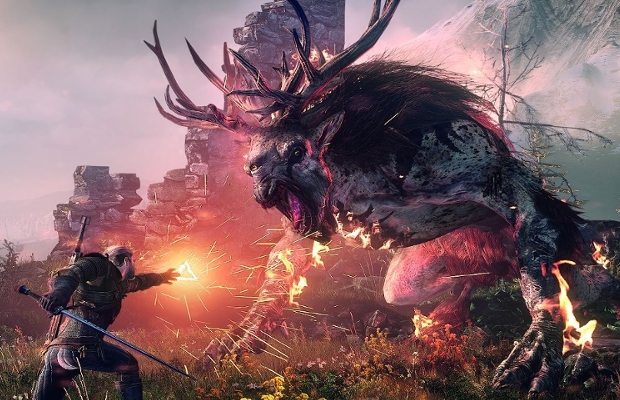 What we saw would be considered a boss in most RPGs, but in Wild Hunt, encounters of this magnitude are the norm. From there, we engaged in a quest that tasked Geralt with deciding the fate of a dangerous creature living in a murky forest close to a divided village. One side of the not-so-thriving community worshiped the beast as some sort of god, while the younger generation living there only saw the thing, which Geralt soon identified as a very old male Leshen, as a plague to their home. The developer decided to accept a sack of coin and deal with the pale, lanky being, which was defeated through a series of quick dodges and swift swipes of the sword. Combat continued to look sharp, but it was the human drama and player choice that made this particular quest fascinating. Choosing the side of the village youth caused a battle for power in the community while Geralt took care of business in the forest. A small cinematic sequence explained the grim future of the village due to the coin-fueled choices you followed, which only made me consider how different this world could look from player to player. What we were shown was just a simple side quest. It’s difficult to convey how expansive a game like The Witcher 3: Wild Hunt will really be when it launches on PC and next-gen consoles next year, but what CD Projekt RED brought to E3 has me reserving a hundred hours of my life in 2014 to play this visually stunning RPG. Now might be the time to brush up on your Witcher lore to prepare for the final chapter.